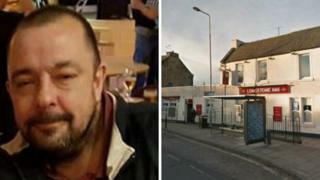 Three men have been charged with the murder of a man who was found in a lane outside an Edinburgh pub. Mark Squires, 44, from Edinburgh, was found with serious injuries next to the Longstone Inn on Longstone Road at 01:30 on Sunday. He later died. The men, aged 21, 23 and 24, are in custody and are due to appear at Edinburgh Sheriff Court on Wednesday. Two women who detectives wanted to trace have been assisting with inquiries. Det Insp Dave Pinkney, of Police Scotland, said: "I am very grateful for the assistance of the local community, who have showed great support to the family and friends of Mark Squires and to my team whilst carrying out our inquiries locally. Our deepest sympathies remain with Mark's family and friends at this time. "I would also like to thank the Longstone Inn and the Jaflong Tandoori for their patience whilst we examined the scene of the incident which happened outside their premises whilst they were closed. "I'm still keen to hear from anyone who may have information about the disturbance and there will be additional patrols in the area to offer further reassurance and for people to speak to should they be able to assist the investigation."